Hit a bit of a snag in my headgasket repair. All the others came out without too much drama. What is the best course of action here? Drill off bolt head, remove cylinder head, soak offending bolt with PB Blaster and attempt bolt removal with a pipe wrench? *Edit...maybe answered my own question...~1x nominal diameter of threads is max strength. So in my case, the upper threads aren't taking much of the load at all. I agree destroy the head of the bolt so you can get the head off. You can try drilling it with a left handed bit so you are working on loosening as you drill. Then you can use penetrating oil and heat and get the remains out of the block. A good sized piece should still be sticking up so you may need to lift the head up straight till it comes off. Get a thread cleaning tap so you can clean up the threads in the block. 12mm 1.5 thread if I recall correctly. If the threads in the block are bad. A timesert is a very good fix. Another approach is the hammer a Torx bit into the hole method and continue to try loosening the bolt. I've had similar luck with hammering on a socket to a rounded off bolt. 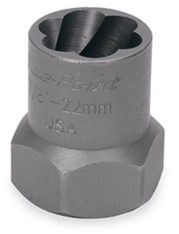 Find a Torx that is a tight fit to the hole and hammer it in. I agree destroy the head of the bolt so you can get the head off. You can try drilling it with a left handed bit so you are working on loosening as you drill. Then you can use penetrating oil and heat and get the remains out of the block. A good sized piece should still be sticking up so you may need to lift the head up straight till it comes off. Get a thread cleaning tap so you can clean up the threads in the block. 12mm 1.5 thread!!!! if I recall correctly!!!!. If the threads in the block are bad. A timesert is a very good fix. 12 x 1.75 si vous plait, mon sewer. Before ya try the Torx--which MIGHT work if you make it into a broach) is to select fit an allen..and kiss super square the flat surface so its sharper. Also a good nasty whack holding a cold chisel (hold with Vise-grips so you don't break your navicular when you miss) aiming to rotate counter clockwise..a coupla whacks..THEN re-try..
What IS the actual allen size? Wire brush the fawk outta the bolt threads. Get a M12 x 1.75 tap and chase all the head bolt threads.. Then light oil. Allen key is a 10mm iirc. This type of extractor might get a good enough bite to get it out. I have a set and they work well. There's also this style if there's room. OK that means the hex is a little over 10..or .0393...7/16" is .4375"
A guy could grab your handy 4" sand disc on your handy angle grinder and kiss off smidge off each flat of an Allen wrench till you could JUST juste bang the fawker in-a sawed off hunk--squared up with your handy 4" sander.. This of course AFTER the oblique whacks with the cold chisel. I ended up drilling one of the heads off the Allen bolt, removing the head then you can use a little pipe wrench on the remaining part of the bolt sticking out. Yes, 10mm allen head and M12x1.75 threads on the head bolts. I will report back on any developments. I'd put the surrounding bolts back in so it takes some of the lifting pressure off of that one remaining bolt. Thanks. I’ll put them back in before working on the trouble bolt. 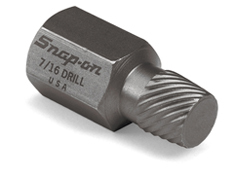 I have a set of used once 14mm head bolts for TB cheap if you want to get rid of that internal hex cap bolt crap. In some sorta of pattern like tightening pattern, same on exhaust nuts. 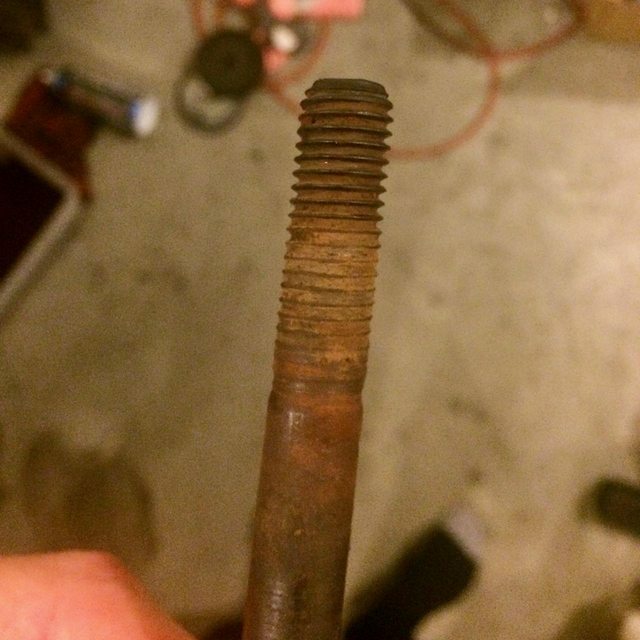 Did you dig all the crud out of the top of the bolt before trying to loosen them? Just checking...maybe there's more space in that bolt head that's not rounded off...if you dig the oil crust out. Probably would have done that by now. Guessing you're not going to re-use those but if you were, I have spares of that style if you want a few. Good news is that the head is off, but what a chore! I drilled the head off of the bolt, but then had to lift the head off of what was left which turned out to be quite difficult because of how close it is to the firewall. Next step is to work on what remains of the bolt in the block. Last edited by oldschoolvolvo; 11-09-2018 at 07:34 AM.. 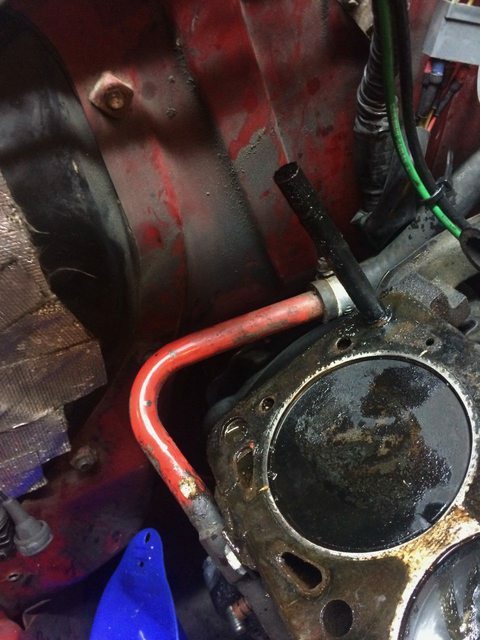 The big question- how does the gasket look? Ha, that's true...gotta look on the bright side. 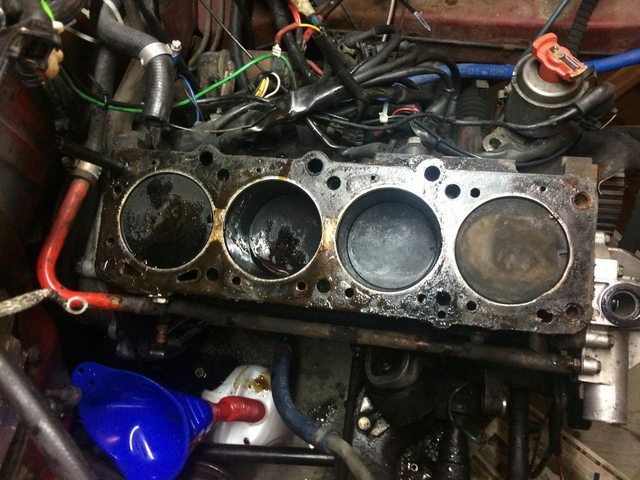 This is my first headgasket job, so to be honest I don't exactly know what I'm looking for as far as a failure mode. 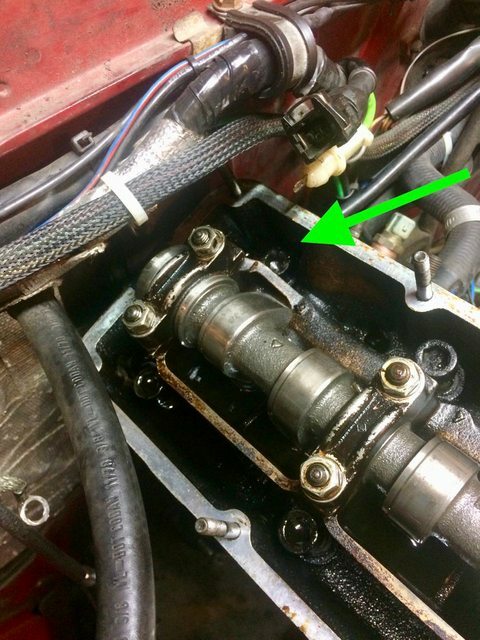 Looks like#2 is cleaner than the rest, that's probably where your coolant was going. I believe that is just the light in that pic...after closer inspection, #1 has noticably less carbon on the majority of the piston surface. Remainder of the last bolt is out. It came out rather easily with a small pipe wrench and a cheater bar to get it started. 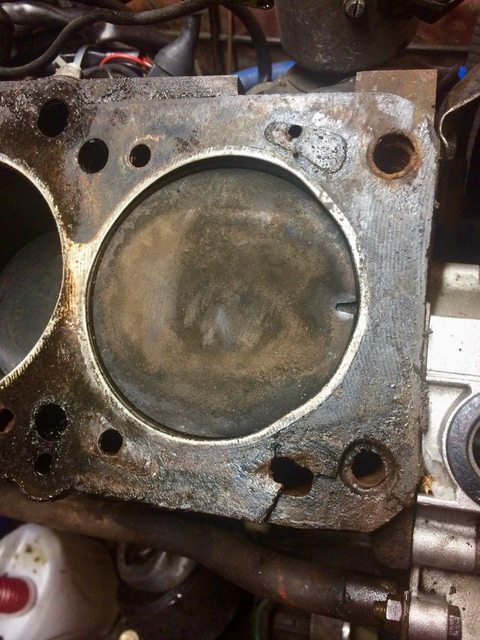 Here's a pic of the headgasket at the #1 cylinder. IMO the 5:00 position looks to be where the problem was (Note: the extreme corner of the gasket got damaged when I was trying to get the head off). 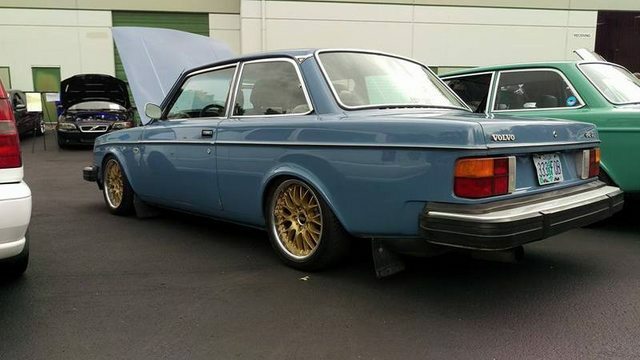 My first B21F powered 242 was peeing coolant right at that same spot. Out the side of the front corner. Glad that bolt came out. That looks like a 30 year old gasket. Nicely done!